This week started off with a relatively flat trading day, as the Dow closed down just 13 points. It bobbled back and forth from red to green, but remained relatively flat for most of the day. There still lacks a "spark" for investors to get either excited or scared about the market. Each day rotates with positive and negative indicators, which just frustrates investors more. So for me, instead of playing a guessing game, I'm looking harder at things that have a bit more transparency and likelihood. One thing is almost certain, the government cannot afford to participate much longer in 0% interest rates and other programs that are spiking the deficit. Our deficit for 2010, alone, is expected to be $1.6 trillion, followed by an additional $1.3 trillion added in 2011. We know it is the government's hope and intention to try and minimize the degree of economic decay throughout this recession, however, they are going to have to start picking and choosing their battles. 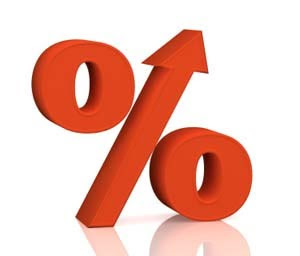 For just about the past year, we have enjoyed o% interest rates from the Fed. As of now, its presence is almost not even felt, which is scary when you consider just how monumental it is to have, essentially, a 0% discount rate from the Fed. Even though the 0% is a big factor in helping what little lending is being done at the moment, the fact is the Fed can't afford to keep it at such low levels for much longer. We can expect a hike in interest rates shortly. Maybe not the next FOMC meeting, but I believe it is in our very near future. As a result, how can I benefit from such a move? Well, here are a few ETF's that are working their way in my portfolio as a hopeful hedge against the hiking rates. First off, what affect will climbing rates have on our economy? The most certain answer is a big influence on the debt markets, especially US Treasuries. As soon as volatility in interest rates begin to show, the first hard hit will be seen in long term bonds. US Treasuries are no exception to this. PST and TMV are both SHORT, longer term US Treasuries. PST is the UltraShort 7-10 year US Treasury, where TMV is the SHORT 3X 30 year US Treasury. In a normal supply and demand environment, as interest rates make their way up, we should start seeing rather aggressive selling of these long term bonds, thus making profits from these two ETFs potentially strong. Well, where will all these liquidating bond holders go? The answer is shorter term bonds. In environments of increasing volatility in interest rates, investors tend to shorten their risk with shorter term lengths. They don't mind giving up some of their yield in return of a much shorter holding period. As a result, investors can then still earn a decent return, while not having to lock themselves in a 30 year bond. Bonds should continue to hold strong in the midst of this tumultous economy, so demand for Treasuries should remain strong. SHY is the iShares 1-3 year US Treasury ETF. Sure, with rising rates even short term bonds could suffer as well, however, I feel that they still have a much greater potential for stronger yields than long term bonds. For the more sophisticated trader, a put option buy on the inverse of the above ETFs may be a good consideration, in hopes to have any ETF decay play to your advantage. In that case, a put option would be purchased on SHV, UST, and TMF for essentially the same effect. However, do keep in mind that put options have time restraints, where you can hold the actual ETF with no expiration period. For those that are looking for some practice trading, check out Wall Street Survivor , which is a fun fantasy stock trading site. Just some food for thought. Happy Trading. If anyone stuck with these stocks they would need 100-2500% return just to break even. I’m worried about that newbie jumping in SRS at $40... sure hope he didn’t. I’m not mocking anyone here- I’m just saying this was the worst advice FF had ever given. I will admit from October to March5th FF was godlike. He was right 9 out of 10 times when it came to market situations. Then when an obvious rally was taking place he announced NOT to take the reins and ride the profit wave. In the beginning the only thing that was evident was a market rally and thats all I wanted to capitalize on... My long term trades were suppose to be AAPL, BRK.B, GOOG, LVS once a bottom was established, which I was a strong believer anything below 7000 was bottom enough for me. My beliefs were skewed by everyone else’s negative sentiment. I even wanted to invest in BAC and C short term when Meredith Whitney was saying banks will have a good strong quarter. All my thinking resulted in head shaking and laughter because those decisions I wanted to make were more than foolish apparently they were hysterical. The problem is that no matter what happens in the future, these predictions will still be 100% wrong because of one major thing. They lose value over time. Buying 1 or 2 year puts on these puppies are anyones best bet on making an honest buck as long as the puts aren’t priced too high. Hindsight is great, and yes much of what I felt was going to transpire the past 12 months, has not, but by no means does that mean that the bad days are behind us. First of all, when trading it is always to wise to trade with stop losses, especially in very volatile times. From this, I was able to minimize my losses and patiently wait for better entry times. Well, that waiting has been extended much longer than I orginially anticipated. The government changed the game entirely. Im not saying they fixed the problems, they have done a great job of concealing them at this point. I am still very much on my toes and am still expecting another leg down. Sure, I have had a mediocre 8 months, but I had an amazing 3 years prior to that. I haven't even come close to eating into those gains. It is never my intention or goal of this site to influence your own trading decisions. I present my personal belief and my personal moves in my own portfolio. If you feel strongly about something happening, then go with it. I don't always disagree with Cramer. He just has the fortune of being able to shoot his shows a day later then he says. Exciting things are to come with this market...stay tuned.